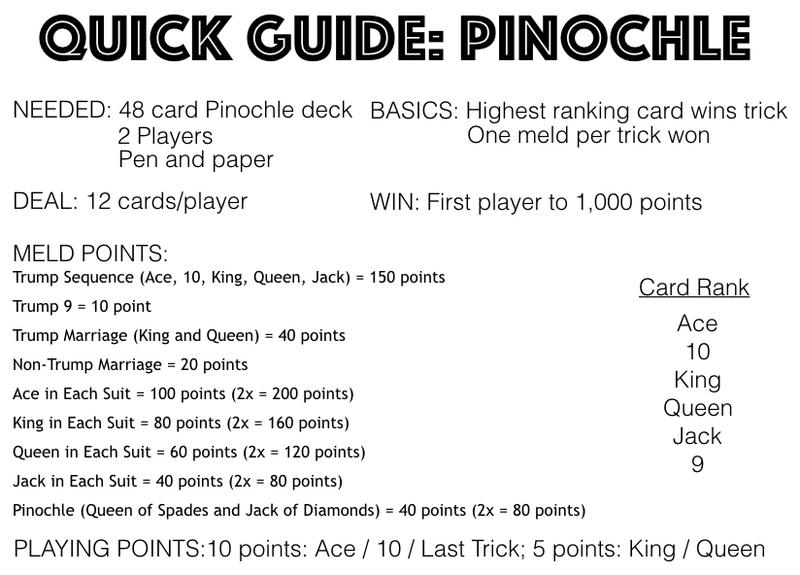 Pinochle is a more advanced card game with points being scored from a melding phase and a trick-taking playing phase. The first video tutorial and explanation is for 4 players divided into 2 teams. The second video tutorial and explanation is for 2 players. 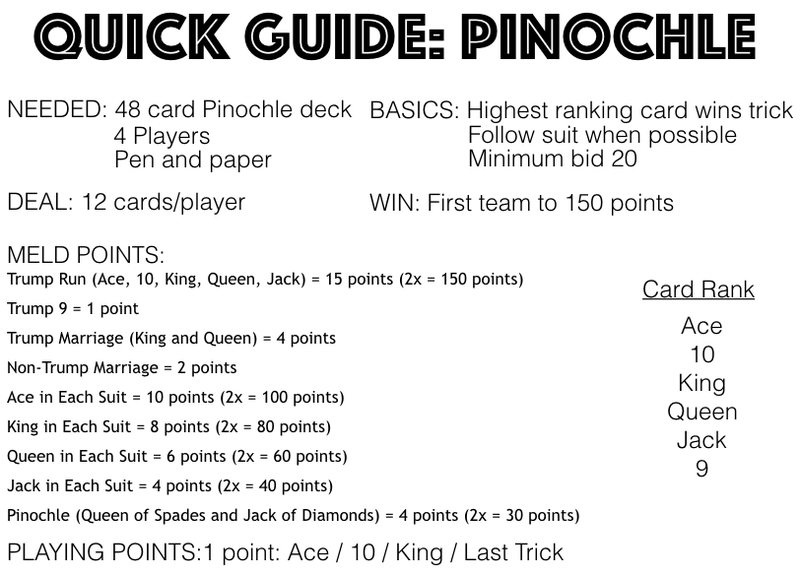 Be sure to keep the Pinochle quick guide close while playing for a quick reference to help you learn as you play! Deal: Each player is dealt 12 cards in sets of 3 cards at a time. Objective: The objective is to be the first team to score 150 points. Points are scored through the melding and playing phases. Bidding: The player left of the dealer is first to bid. The minimum amount to bid is 20 or a player can pass on bidding. Bidding continues clockwise with each player bidding higher than any previous bids or passing. Players can bid multiple times. A player wins the bid when all other players have passed. Card Pass: The bid winner’s partner will pass 3 cards to his/her partner. The bid winner looks at the cards and then decides on 3 cards to pass back to his/her partner. No cards are passed between the team that did not win the bid. Playing Phase: The bid winner plays the first card. Play moves clockwise with each player having to play a card in the same suit that was led whenever possible. If a player cannot follow the lead suit, he/she has to play a trump suited card. If a player cannot follow the lead suit or play a trump suited card, he/she can play any card. Also, a player must beat the high card played if possible, even if the card is your partners. The winner of the trick is the player who played the highest ranking trump card. If no trump suited cards were played, the winner of the trick is the player who played the highest ranking card in the lead suit. Each Ace, 10, and King won in a trick counts for 1 point each. The team that wins the last trick receives an additional point. Scoring: The points from the meld phase are added to the points from the playing phase. If 2 cards of the same rank are played, the first card played wins the trick. The non-bidding team must take at least one point during the playing phase or else they lose any melded points for the round. If a team does not make their bid it is known as going set. If set, the team loses the amount of points bid. If both teams go over 150 points in the same round, the bidding team wins the game. Even if the non-bidding team ends up with more overall points. Deal: 12 cards are dealt to each player in sets of 4 cards. The top card of the remaining deck is flipped up and partially placed under the deck. The suit of the flipped up card is the trump suit for the round. If the dealer flips up a 9 from the deck, he/she is awarded 10 points. Objective: The object of the game is to be the first player to score 1,000 points. Points are scored through melds and winning tricks that include aces, tens, kings, or queens. After a meld is played, or if the winning player did not have a meld to play, the winner of the last trick will draw the top card of the deck, and the loser of the last trick will draw the next card to return their hands to 12 cards. The player that won the last trick will lead the next trick. If a player has the 9 of trump, he/she is allowed to switch it with the flipped up card from the deck after winning a trick. A player that switches a 9 of trump is awarded 10 points. 10 points are also awarded to a player who melds a 9 of trump, or plays a 9 of trump into a trick. When the deck only has one card left face down and the trump card face up, the winner of the next trick takes the last card from the deck, and the loser of the trick takes the flipped up trump card. After the last cards are drawn, no more melds can be scored. The last 12 cards are played for taking tricks only. On these last 12 tricks a player has to follow the lead suit if possible, and obligated to win the trick if possible. The player that wins the last trick is awarded 10 points. Each player will count the number of aces and tens won, and are awarded 10 points for each. Each player will count the number of kings and queens won, and are awarded 5 points for each. Only one meld can be scored after a trick is won. When multiple melds are laid down together, another trick must be won before scoring an additional meld. For example, the queen of spades from a previously melded marriage, and a jack of diamonds currently being melded with 4 jacks can be combined to form a pinochle, but the player can only score the 4 jacks or the pinochle on the turn. The other is score upon winning another trick. A card can be used for multiple melds if the melds are different. A queen of spades can be melded in a marriage, a sequence, a pinochle, and 4 queens. If a queen is played from a melded 4 queens, another queen cannot be added to the remaining 3 queens to score again. All 4 queens must be different to score again.